143. Between 1990 and 2000 , what was the increase in energy use for the PC Room, Meeting Rooms space combined? 145. Which space experienced the smallest change in energy use between 1990 an 2000? 146. 3 individuals john wright, greg chappell and gary kristen are in the race for the appointment of new coach of team india. The probabilities of their appointment are 0.5, 0.3 and 0.2 respectively. If john wright is appointed then probability of ganguly appointed as a captain will be 0.7 and corresponding probablity if greg chappell or gary kristen is appointed are 0.6 and 0.5 respectively. find the overall probability that ganguly will appointed as a captain. 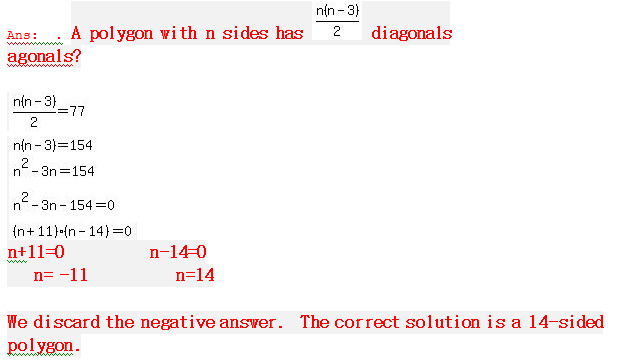 148. a polygon has 77 diagonals.Determine the number of sides. 149. if(m^4+m^-4)=47,then determine the value of (m+m^-1). 150. P lends Rs 3000 to Q and certain sum to R at 5% P.a Simple Interest. If after 4 years P altogether receives Rs 1200 as interest from Q and R then what was the sum lent to R? 151. The direct distance between City A and City B is 300 miles. The direct distance between city B and City C is 400 miles. What could be the direct distance between city C and City A? Ans: . There are two possibilities with the given data. 152. If the curved surface area of a cone is twice that of another cone and slant height of the second cone is twice that of the first. Find the ratio of the area of their bases. 155. A cone of slant height 20 cm has a curved surface area of 880 cm2. Determine the base radius of the cone. 156. The ratio of three numbers is 4:5:6 and sum of their squares is 7700. What is the sum of the numbers. 157. Two cone have their heights in the ratio 2:1 and their base radius in the ratio 1:4 . what will be their volumes ratio? 159. Anitha has 3 novels and 4 dictionaries. Determine the number of ways in which all 7 books can be arranged on the shelf so that the books of the same kind must be kept together. 160. A container contains a mixture having orange juice, pine apple juice and water in the ratio ½ : 1/3: 1/5. What is the approximate percentage of pine apple in the container?